At the turn of the 18th Century, our ancestors took part in two unsuccessful naval expeditions to Canada. The Battle of Québec was fought in October 1690 between the colonies of New France and Massachusetts. 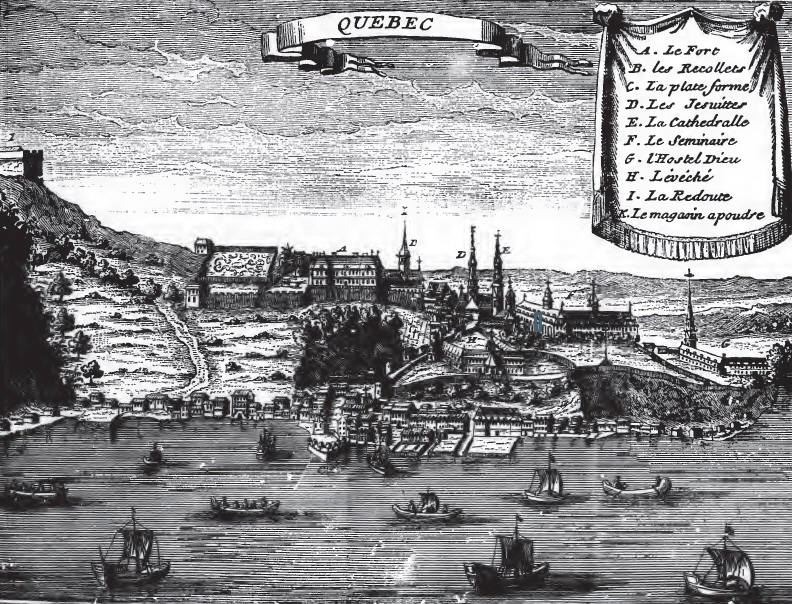 Following the capture of Port Royal in Acadia, during King William’s War, the New Englanders hoped to seize Montréal and Québec itself, the capital of New France. The loss of the Acadian fort shocked the Canadiens, and Governor-General Louis de Buade de Frontenac ordered the immediate preparation of the city for siege. When the envoys delivered the terms of surrender, the Governor-General famously declared that his only reply would be by “the mouth of my cannons.” Sir William Phipps led the invading army, which landed at Beauport in the Basin of Québec. However, the militia on the shore were constantly harassed by Canadian militia until their retreat, while the ships were nearly destroyed by cannon volleys from the top of the city. 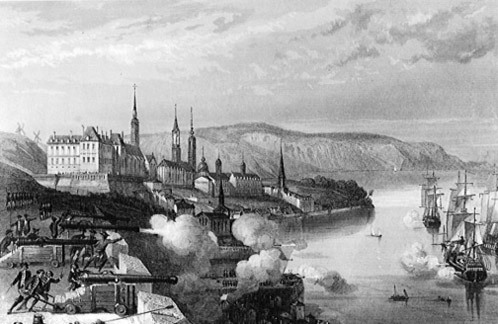 Battle of Quebec 1690 – The Batteries of Quebec bombard the New England fleet. Edmund GREENLEAF’s son Captain Stephen Greenleaf (1628-1690) drowned 1 Dec 1690 off Cape Breton, Nova Scotia, Canada, at age 62 . In the French and Indian War, Captain Stephen Greenleaf, Lieutenant James Smith, Ensign William Longfellow, Sergeant Increase Pillsbury, William Mitchell and Jabez Musgrave were cast away and lost on an expedition against Cape Breton. “I consulted with the officers & twas concluded to march forwards, & then devided our provition, wch was about 35 cakes of bread for each souldr, besides pork, which was scarce eatable. At this post (Saratoga) i left Liut Tho. Avery with some souldrs to gaurd our provition to us wch was coming up the river”. (The Winthrop Papers, Massachusetts Hist. Col., Fifth Series, 8:314). For an account of this expedition, see Avery’s “History of the United States and Its People,” vol. 3, pages 263, 264. Capt. Stephen CROSS (1646 – 1704) was a commander of the ketch Lark in the Battle of Quebec. The Lark was a Salem vessel and Cross brought her back to her home port on March 18, 1690/91, and the arms on board were placed in Mr. Derby’s warehouse. His was one of about thirty-two ships (only four of which were of any size) and over 2,3000 Massachusetts militia men. Lieut. Jabez SNOW (d. 27 Dec, 1690) . Eastham. 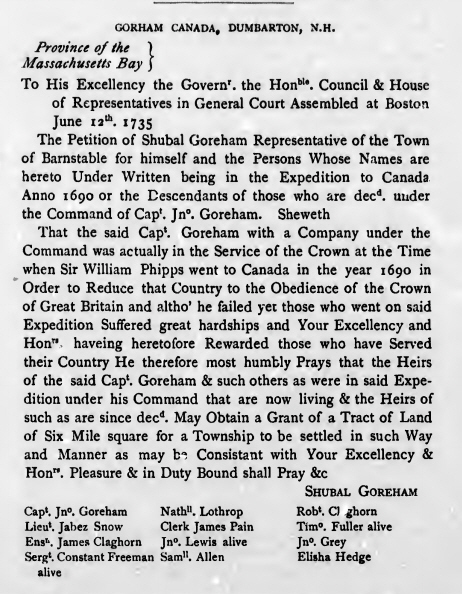 Shubael Gorham ((1686 – 20 Feb 1746, Louisbourg, Nova Scotia) was John’s son and the grandson of John GORHAM Sr. He was a military officer and had sailed with Colonel John March in 1707 and then again as an ensign in Captain Caleb Williamson’s Barnstable Company with Nicholson when the English took Port Royal in 1710. His greatest service, however, was his successful effort in obtaining the grants of Nargansett Townships to the heirs of the soldiers who fought in King Philip’s War. Col. Gorham spent much time and money promoting the settlement of Gorhamtown, now Dunbarton, Merrimack, New Hampshire. He bought the shares of many who did not desire to emigrate, but his speculations in the wild lands proved unfortunate. Buying such lands is like lottery tickets, a few get prizes. Col Gorham was not one of the lucky ones. He died insolvent in 1746, his own children being his principal creditors. As you can see in the above petition, Shubael also advocated for veterans of the 1690 Canada Expedition. John GUILFORD’s son Paul (1653 – 1690) died during an expedition for an assault on Quebec, possibly of small pox. He first marched under Capt. Joshua Hobart of Hingham in 1675 during King Philip’s War, being on the roll of payments 24 August 1675. He once more marched under Capt. Samuel Wadsworth and was paid on 24 July 1676 and Hingham paid him further for service under Capt. John Holbrook . Paul was on expedition with Sir William Phipps [of Maine] who first sailed from Boston early in the spring of that year to Port Royal [Nova Scotia] to fight the French [in King William’s War]. That effort being successful, Phipps again regrouped at Boston with about 30 ships and 2,000 Massachusetts men for an assault on Quebec, this expedition meeting with disaster. Paul was among those who were either killed or carried off by smallpox during this expedition. Thomas WOOD’s son Samuel (1666 – 1690) died 25 Nov 1690 at Port Royal. Ezekiel JEWETT’s son Ezekiel Jr (1669 – 1690) was in the Canada expedition 1690 and no further mention is found of him.” The town records of Rowley of May 6, 1691 show that the town paid the following named persons, in bills of credit, the sum set against their names for military service in Canada. To Deacon Ezekiel Jewett for his son Ezekiel £5 0s. 3d. 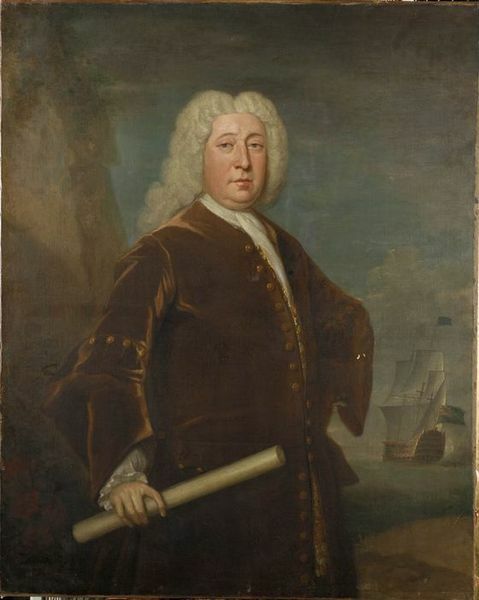 Edward HARRADEN (1624 – 1683) son John Harraden (1663- 1724) was pilot of HMS Montague, (sixty guns, commanded by Sir George Walton) in the disastrous 1711 expedition against Canada. HMS Montague – Launched in 1654 as the Lyme a 52-gun third rate Speaker-class frigate built for the navy of the Commonwealth of England at Portsmouth After the Restoration in 1660 she was renamed HMS Montague. She was widened in 1675 and underwent her first rebuild in 1698 at Woolwich Dockyard as a 60-gun fourth rate ship of the line. Her second rebuild took place at Portsmouth Dockyard, from where she was relaunched on 26 July 1716 as a 60-gun fourth rate to the 1706 Establishment. Montague was broken up in 1749. Armament: 60 guns of various weights of shot. A third rate was a ship of the line which mounted between 64 and 80 guns, typically built with two gun decks (thus the related term two-decker). Years of experience proved that the third rate ships embodied the best compromise between sailing ability (speed, handling), firepower, and cost. So, while first rates and second rates were both larger and more powerful, the third-rate ships were in a real sense the optimal configuration. By contrast, Jack Aubrey’s Surprise was a 6th Rate with 28 guns. During the voyage Walton and the Montagu captured two prizes. After the failure of the expedition, Walton returned to England and was appointed to act as commander-in-chief at Portsmouth in December 1712. This resulted in Thomas Corbett pronouncing him fitter to achieve a ‘gallant action’ than to describe one. The Quebec Expedition, or the Walker Expedition to Quebec, was a British attempt to attack Quebec in 1711 in Queen Anne’s War, the North American theatre of the War of Spanish Succession. It failed because of a shipping disaster on the Saint Lawrence River on 22 August 1711, when seven transports and one storeship were wrecked and some 850 soldiers drowned; the disaster was at the time one of the worst naval disasters in British history. The expedition was planned by the administration of Robert Harley, and was based on plans originally proposed in 1708. Harley decided to mount the expedition as part of a major shift in British military policy, emphasizing strength at sea. The expedition’s leaders, Admiral Hovenden Walker and Brigadier-General John Hill, were chosen for their politics and connections to the crown, and its plans were kept secret even from the Admiralty. Despite the secrecy, French agents were able to discover British intentions and warn authorities in Quebec. The expedition expected to be fully provisioned in Boston, but the city was unprepared when it arrived, and Massachusetts authorities had to scramble to provide even three months’ supplies. Admiral Walker also had difficulty acquiring experienced pilots and accurate charts for navigating the waters of the lower Saint Lawrence. The expedition reached the Gulf of Saint Lawrence without incident, but foggy conditions, tricky currents, and strong winds combined to drive the fleet toward the northern shore of the Saint Lawrence near a place now called Pointe-aux-Anglais, where the ships were wrecked. Following the disaster, Walker abandoned the expedition’s objectives and returned to England. Although the expedition was a failure, Harley continued to implement his “blue water” policy. 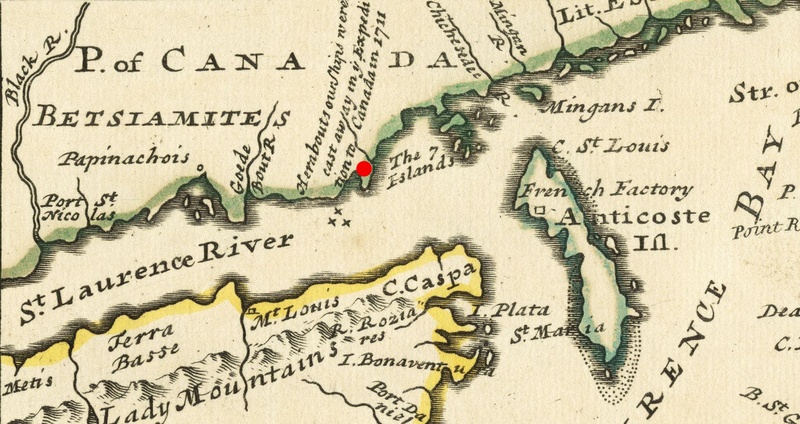 Expedition to Quebec 1711 – The approximate site where the fleet went aground is marked in red on this 1733 map detail. The fleet arrived in Boston on 24 June, and the troops were disembarked onto Noddle’s Island (the present-day location of Logan International Airport). The size of the force was, according to historian Samuel Adams Drake, “the most formidable that had ever crossed the Atlantic under the English flag.” Since the fleet had left with insufficient supplies, its organizers expected it to be fully provisioned in Boston. Since the number of soldiers and sailors outnumbered the population of Boston at the time, this proved a daunting task. Laws were passed to prevent merchants from price-gouging, but sufficient provisions were eventually acquired. Additional laws were passed penalizing residents found harbouring deserters from the fleet; apparently the attraction of colonial life was sufficient that this was a significant problem during the five weeks the expedition was in Boston. During the expedition’s sojourn in Boston, Walker attempted to enlist pilots experienced in navigating the Saint Lawrence River. To his dismay, none were forthcoming; even Captain Cyprian Southack, reputed to be one of the colony’s best navigators, claimed he had never been beyond the river’s mouth. Walker intended to rely principally on a Frenchman he had picked up in Plymouth prior to the fleet’s departure. Samuel Vetch, however, deeply distrusted the Frenchman, writing that he was “not only an ignorant, pretending, idle, drunken Fellow”, but that he “is come upon no good Design”. Following this report, Walker also bribed a Captain Paradis, the captain of a captured French sloop, to serve as navigator. The charts Walker accumulated were notably short in details on the area around the mouth the Saint Lawrence, as was the journal Sir William Phips kept of his 1690 expedition to Quebec, which Walker also acquired. Walker interviewed some participants in the Phips expedition, whose vague tales did nothing to relieve his concerns about what he could expect on the river. These concerns prompted him to detach his largest and heaviest ships for cruising duty, and he transferred his flag to the 70-gun Edgar. On 30 July, the fleet set sail from Boston. It consisted of a mix of British and colonial ships, including nine ships of war, two bomb vessels, and 60 transports and tenders. It carried 7,500 troops and about 6,000 sailors. By 3 August the fleet reached to coast of Nova Scotia, and Samuel Vetch piloted the fleet around Cape Breton and Cape North and into the Gulf of Saint Lawrence. On the morning of the 18 August, just as the expedition was about to enter the Saint Lawrence River, the wind began to blow hard from the northwest, and Walker was forced to seek shelter in Gaspé Bay. On the morning of the 20th, the wind veered to the southeast, and he was able to advance slowly past the western extremity of Anticosti Island before it died down and thick fog blanketed both shore and fleet. By the 22nd, the wind had freshened from the southeast, and there were intermittent breaks in the fog, but not sufficient to give sight of land. At this point the fleet was west of Anticosti at a point where the Saint Lawrence was about 70 miles wide, but it narrowed noticeably at a point where the river’s North Shore made a sharp turn, running nearly north-south. This area, near what is now called Pointe-aux-Anglais, includes a number of small islands, including Île-aux-Oeufs (Egg Island), and numerous rocky shallows. After consulting his pilots, Walker gave the signal to head the fleet roughly southwest at about 8:00 pm. Walker had thought he was in mid-stream when he issued the order. In fact, he was about seven leagues (about 20 miles) north of his proper course, and in the grasp of strong currents which steered his ships towards the northwest. Aided by an easterly wind, the fleet was gradually closing on the “North Shore“, which in the vicinity of Île-aux-Oeufs (Egg Island) runs almost north and south.When Captain Paddon reported to Walker that land had been sighted around 10:30 pm, presumably dead ahead, Walker assumed that the fleet was approaching the south shore, and ordered the fleet to wear, and bring-to on the other tack before heading to bed. This maneouvre put the fleet onto a more northerly heading. Some minutes later, an army captain named Goddard roused Walker, claiming to see breakers ahead. Walker dismissed the advice and the man, but Goddard returned, insisting that the admiral “come upon deck myself, or we should certainly be lost”. Walker came on deck in his dressing gown, and saw that the ship was being driven toward the western lee shore by the east wind. When the French navigator came on deck, he explained to Walker where he was; Walker immediately ordered the anchor cables cut, and beat against the wind to escape the danger. Two of the warships, Montague [John Haraden’s ship] and Windsor, had more difficulty, and ended up anchored for the night in a precarious situation, surrounded by breakers. Throughout the night, Walker heard sounds of distress, and at times when the fog lifted, ships could be seen in the distance being ground against the rocks. One New Englander wrote that he could “hear the shrieks of the sinking, drowning, departing souls.” Around 2:00 am the wind subsided, and then shifted to the northwest, and most of the fleet managed to stand away from the shore. The fleet sailed down the Gulf of Saint Lawrence and came to anchor at Spanish River (now the harbour of Sydney, Nova Scotia) on 4 September, where a council was held to discuss whether or not to attack the French at Plaisance. Given the lateness of the season, insufficient supplies to overwinter in the area, and rumours of strong defences at Plaisance, the council decided against making the attack, and sailed for England. Francis Nicholson’s land expedition learned of the naval disaster when it was encamped near Lake George; Nicholson aborted the expedition. He was reported to be so angry that he tore off his wig and threw it to the ground. The expedition’s fortunes did not improve on the return voyage. Walker had written to New York requesting the HMS Feversham and any available supply ships to join him; unbeknownst to him, the Feversham and three transports (Joseph, Mary, and Neptune) were wrecked on the coast of Cape Breton on 7 October with more than 100 men lost. The fleet returned to Portsmouth on 10 October; Walker’s flagship, the Edgar, blew up several days, possibly due to improper handling of gunpowder. Walker lost a number of papers as a result, and claimed that the journal of William Phips was lost in the blast. Despite the magnitude of the expedition’s failure, the political consequences were relatively mild. The failure was an early setback in Robert Harley‘s “blue water” policy, which called for the aggressive use of the navy to keep England’s enemies at bay; however, Harley continued to implement it, withdrawing further resources from European military campaigns. Since the project had been organized by the current government, it was also not interested in delving deeply into the reasons for its failure. Walker was sympathetically received by the queen, and both he and Hill were given new commands. Walker eventually wrote a detailed and frank account of the expedition, based on his memory as well as surviving journals and papers; it is reprinted in Graham. Walker was stripped of his rank in 1715 (amid a larger change of power including the accession of King George I), and died in 1728. Popular sentiment in England tended to fault the colonies for failing to properly support the expedition, citing parsimony and stubbornness as reasons. These sentiments were rejected in the colonies, where Nicholson and Governor Dudley instead blamed Walker. The relations between the military leadership and the colonial populations was not always cordial during the army’s stay outside Boston, and foreshadowed difficult relations between civilians and military occupiers in the political conflicts that preceded the American Revolutionary War. One of Hill’s officers wrote of the “ill Nature and Sowerness of these People, whose Government, Doctrine, and Manners, whose Hypocracy and canting, are unsupportable”, and further commented that unless they were brought under firmer control, the colonists would “grow more stiff and disobedient every Day.” Colonists noted with some disgust the fact that both Walker and Hill escaped censure for the expedition’s failure. This entry was posted in History, Sea Captain, Veteran. Bookmark the permalink. Where can I find rosters of solders on the ships in the Quebec Expedition of 1711? I was given a rope hook from a relative of my dads in Point Cartier Canada that camw off the Phipps Ship in 1690.